While the Pi is busy celebrating its 25th anniversary, the TCS celebrated its 20th anniversary on May 3, 2003, with an Open House. It was an opportunity for a whole bunch of people who never see each oher in person, but only via E-mail or postings on the TCS, to get together, eat food, see flesh and blood people, eat food, talk, eat food, and learn some of the inneer secrets of the Pi's legendary telecommunications system. Before viewing this video, please read the following background information first. I think it will enhance your enjoyment of the movie. 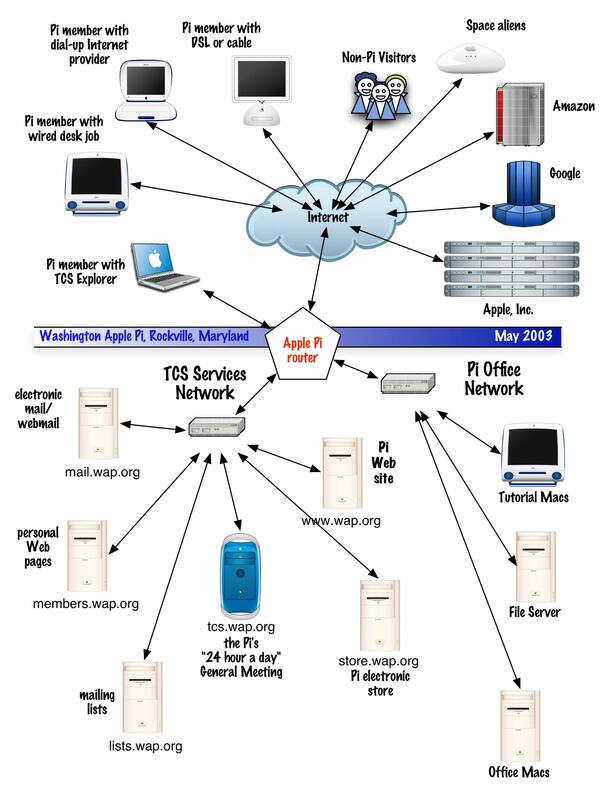 For years the Washington Apple Pi has been running an electronic bulletin board for its members called TCS (TeleCommunications System). 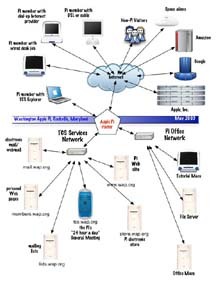 For many Pi members, the TCS also serves as a viable alternative to AOL (America Online) or MSN (Microsoft Network), since it also provides, as an option, Internet access for dial-up users. Since the original TCS servers required continuous air conditioning, the symbol for the TCS became the penguin. In fact, the latest server used to test the new system was named Gentoo, which is a kind of penguin, I'm told. Anyway, the TCS recently upgraded their site significantly, so I created the following video to honor some of the key TCS people. Since there is a high correlation between techies and trekkies (I'm sorry - trekkers), I decided to go with a Star Trek parody. You don't have to be a Trek-person to get most of the humor in the video, but it doesn't hurt. If you have comments or questions, you can contact me at tberens@tiac.net.